Butter Pecan Cake with Buttercream is an easy to make homemade layered cake. 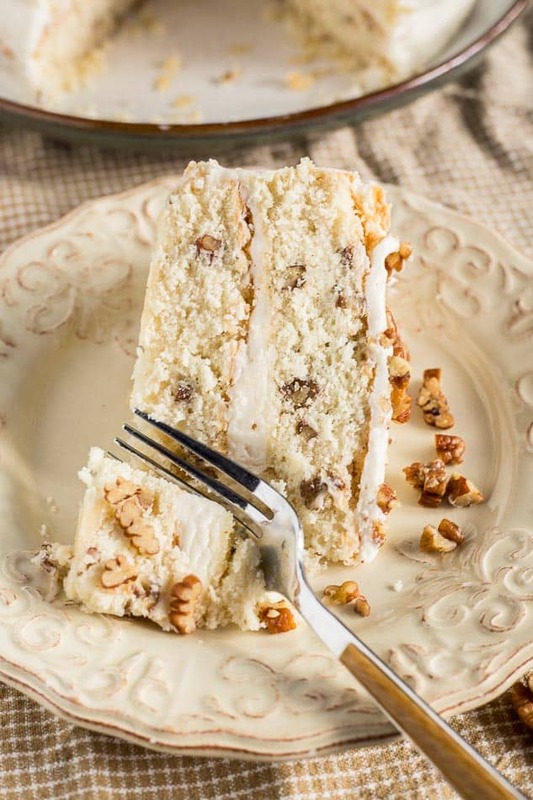 A classic moist white cake with butter toasted pecans and rich buttercream frosting. This cake is bursting with delicious fall flavors and is sure to impress your guests! Pecans are one of my favorite flavors of fall. Even though they’re available year round, they are especially festive this time of year. This Butter Pecan Cake is inspired by the ice cream variety with the same name. It’s rich, creamy and decadent, with a homemade buttercream frosting. For even more butter pecan flavor the pecans are literally browned in butter. This adds buttery goodness and roasted nuttiness to this layer cake. 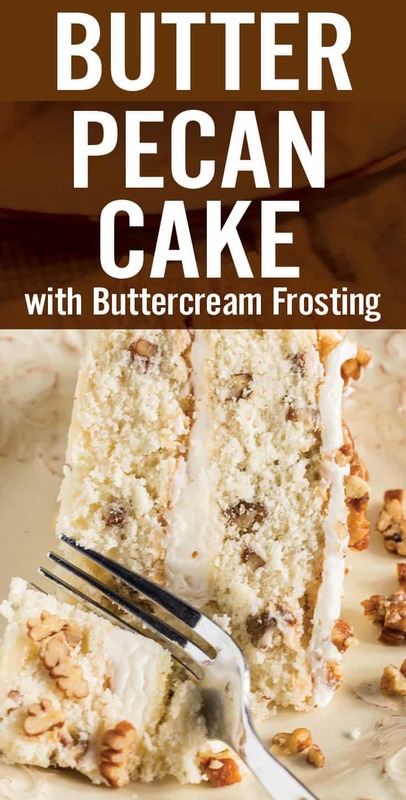 This Butter Pecan Cake with Buttercream Frosting could be described as a fancy cake, but can be made by anyone. There’s no need to cut the cakes layers. Simply use two cakes rounds with a thick layer of buttercream frosting between. I admit frosting is not my strong point, it took me a few tries and hours to properly frost these Chocolate Almond Cupcakes. Since then, I’ve learned my lesson and I try to stay clear from cupcakes and delicately frosted desserts. That’s why I love this butter pecan cake because it’s not a struggle to frost. It’s an easy mix and goes on in one smooth layer. There’s plenty of flavor, and it all bakes into a rich, moist cake. 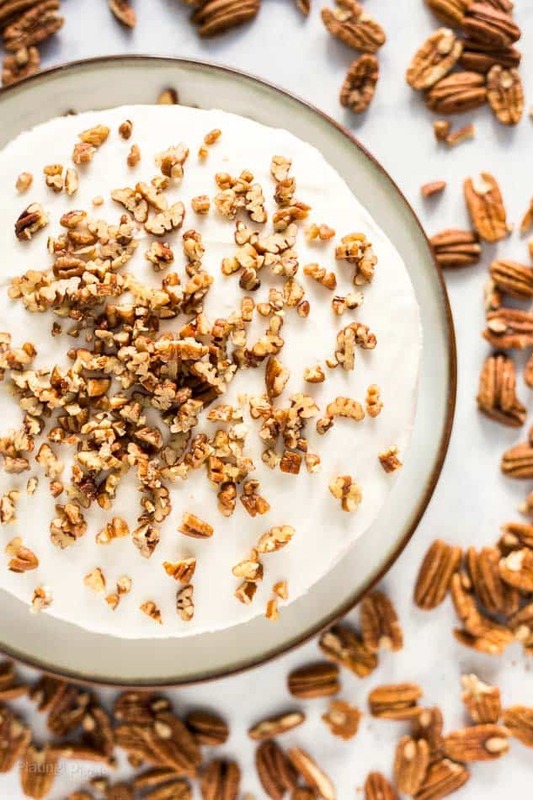 Chopped butter toasted pecans in the batter and on top of the frosting adds texture and buttery bits of flavor. It’s a classic white cake with a twist. Whether you’re an experienced baker or looking to try new recipes, this Butter Pecan Cake is a great way to celebrate the fall season. 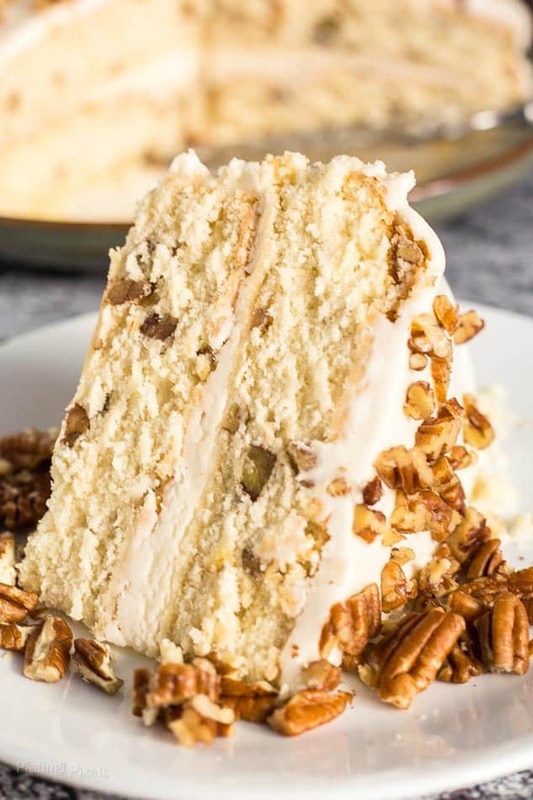 Classic moist white cake with butter toasted pecans and rich buttercream frosting. Melt 3 tbs. butter in a non-stick pan over medium-high heat. Add pecans and cook 4-6 minutes, stirring often, until toasted. Remove from heat and cool. Preheat oven to 350° F. Grease and lightly flour two 8-inch round cake pans. In a medium bowl, stir together flour, baking powder and salt. Set aside. Beat ⅔ cup butter with a large bowl stand or hand mixer on medium high for 30 seconds. Reduce to medium, add sugar gradually, until well combined. Scrape bowl and beat 2 minutes more. Add vanilla and one egg, beating until combined. Beat in remaining egg. On low, alternately add in flour mixture and milk, beating just until combined. Fold in 1-cup of toasted pecans, pour batter evenly into prepared pans. Bake 30-35 minutes, or until a toothpick inserted in center comes out clean. Cool pans on a wire rack for 10 minutes. Remove cake layers from pans and cool on racks to room temperature. Spread buttercream frosting (recipe below) onto top of one layer, add second layer, and frost cake with remaining buttercream. 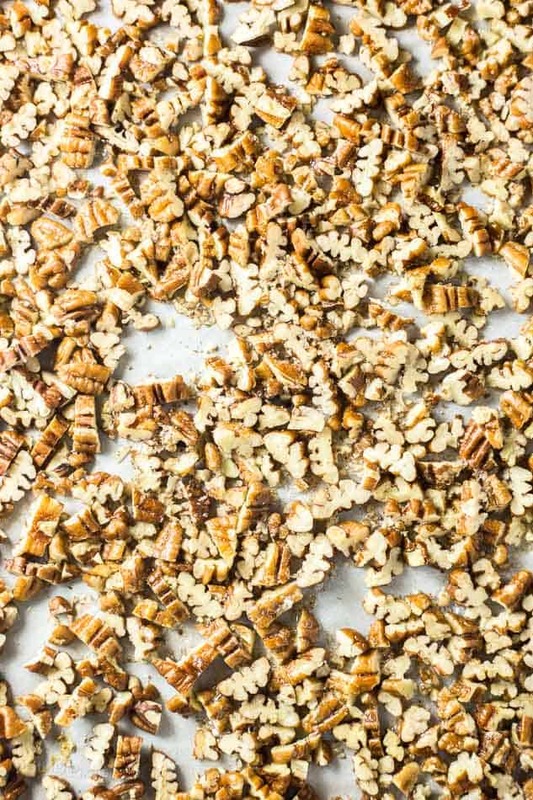 Sprinkle with remaining pecans. In a mixer, beat butter and vanilla on medium until light and fluffy. Reduce to low and slowly beat in 2 cups powdered sugar. Beat in 3 tablespoons milk. Gradually beat in remaining powdered sugar and milk. Use more or less milk to reach desired consistency. Recipe adapted from Better Homes and Gardens: Fall Baking. 2017. Print. Can you use half and half instead of milk?? I don’t see why not. If anything replace a 1/4 of it with water so not as heavy. 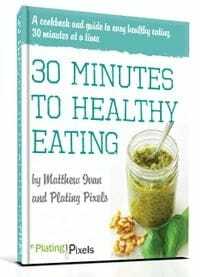 Thanks for checking out the recipe and hope you like it! Can you use a bundt cake pan for this recipe? That’s a great question pat and assume it’s possible. Since you’re not cooking in thinner layers the baking time will most likely be slightly longer. You could add the frosting just on top. 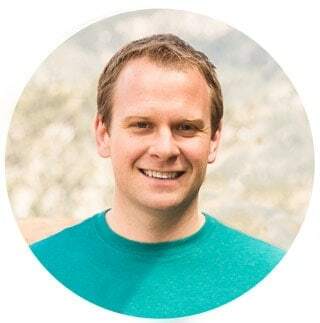 Hey Matt, WOW!! Yummo. This is a delicious looking cake. I agree that you have to have a bit of balance and it’s ok to live a little. I can almost taste the crunch of the pecans in my mouth from all the way over here in Australia!! It’s always a good pairing. Thanks Adrianne! Frosting is my weakness too. And I love the flavor that pecans add to desserts. Clearly, I need this cake! Glad I’m not one of the only ones who struggles with frosting. Thanks Valentina! This cake is so mouth watering! And that frosting also!! YUM! I have a weakness for frosted cakes as well. Thanks Tisha! what a delicious looking cake..its baked to perfection! It’s one of my favorite ice creams and definately the inspiration for this cake. Thanks Cindy!